This CBS National News story highlights both a donating and adopting family that worked with the Snowflakes Embryo Adoption Program. 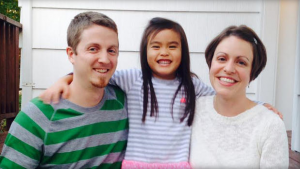 Gina Yasuda and her husband had completed their family, but they had three embryos remaining. Gina’s doctors told her about the Snowflakes Embryo Adoption Program, and the couple signed up. After three years, the Yasuda’s discovered the Stephanie and Ben Hawkins &emdash; they were the ones. In May 2009, Stephanie gave birth the their daughter, Annika. “We can’t imagine not having done embryo adoption and not having her,” said Stephanie.